The adage "there is no 'I' in team" is a handy refrain used to emphasize the importance of teamwork in just about any setting, but new University of Alberta research shows that "I" works best alone when it comes to customer service. In a study looking at how firms should talk to customers, Sarah Moore, a marketing professor in the Alberta School of Business, found that when customer representatives use "I" instead of "we" in consumer interactions, customers are more satisfied and tend to purchase more. "Firms have a pretty strong lay belief that their agents should use 'we' to refer to the agent and the firm, rather than using 'I' to refer to themselves as an individual," said Moore. "But we found that using 'I' is actually better." She said "I" pronouns increase perceptions of the agent's empathy and agency. In turn, that increases satisfaction, purchase intentions and, according to her field data, actual sales up to six months later. "When the firm agent says 'I,' customers believe this person feels more empathy for them and has more agency, and they are going to act on the customer's behalf," she said. "In comparison, when firm agents use 'we,' customers imagine a faceless firm.'" Moore, along with co-authors Grant Packard of Wilfrid Laurier University and Brent McFerran of Simon Fraser University, used field data that included 3,000 customer service email strings that ranged from "I lost my password" to "Where is my shipment?" "We were looking to see if there was any particular language to start with that seemed to have an effect on sales," explained Moore. "We started noticing this pattern in pronoun use and thought, 'I wonder what that does?'" Even when controlling for sentiment, specifically positive and negative emotion words, Moore and her colleagues found that pronouns were more predictive than emotion and other content words that describe the actual nature of the interaction, such as a lost package. Although the researchers didn't investigate the origins of firm agents' language patterns, Moore suspects the use of "we" started out as an organization culture theory that it would be a good idea if everybody were on the same team—and though this may be true from an employee perspective, it may not be optimal for customers. "Apple is a notable exception in current practice. Their agents use 'I' pronouns and their individual names." The researchers also investigated another persistent belief among firms that influences language use: the customer orientation. This states that the customer always comes first, and suggests that firm agents should frequently use the word "you" when referring to the customer—and this is indeed the pattern the researchers found in their data. But does "you" do anything? 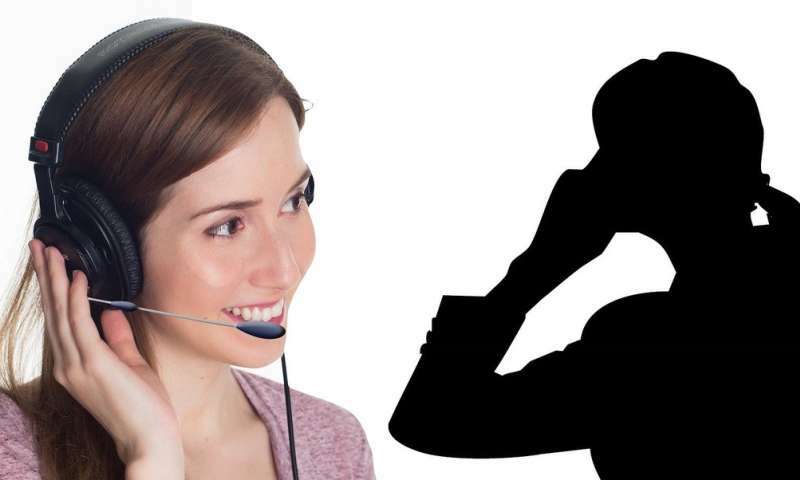 "We found that customer service agents don't actually have to say 'you,' but they do because they think they should," said Moore, adding "you" in this instance is not necessary because it is so obvious in this context. "The customer has already emailed or called, so the use of 'you' has a null effect; it doesn't do anything—it doesn't increase sales, it doesn't change satisfaction, you can take it or leave it. "In short, it doesn't matter if the firm agent says, 'How can I help you?' or, 'How can I help?' These phrases have the same effects on customers." Moore said the study comes at a time when pronouns have become tricky to navigate and carry a heightened importance. "This is particularly interesting because there is all this stuff both in theory and in practice about sentiment and trying to measure what good or bad things your customers are saying about you," said Moore. "That is obviously important, but we think this research shows that it's also important to look at pronouns, and see how they're talking about 'you' and how you're talking back to them."